修改了原来的4星评分，主要是深切的感受到了，一门学科的亲手创建者写出来的东西是最能直达本质的东西，可以使人对概率的理解驭繁为简。abel说过的，learn to master ,not their pupils.越来越感觉到了.. 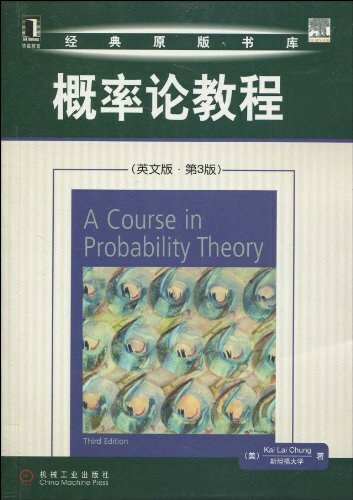 In probability theory the notion of a set plays a more fundamental role. Furthermore we are interested in very general kinds of sets as well as speciﬁc concrete ones. To begin with the latter kind, consider the following examples: (a) a bushel of apples; (b) ﬁfty-ﬁve cancer patients under a certain medical treatment; (c) all the students in a college; (d) all the oxygen molecules in a given container; (e) all possible outcomes when six dice are rolled; (f) all points on a target board. Let us consider at the same time the following “smaller” sets: (a') the rotten apples in that bushel; (b') those patients who respond positively to the treatment; (c') the mathematics majors of that college; (d') those molecules that are traveling upwards; (e') those cases when the six dice show diﬀerent faces; (f') the points in a little area called the “bull’s-eye” on the board. We shall set up a mathematical model for these and many more such examples that may come to mind, namely we shall abstract and generalize our intuitive notion of “a bunch of things.” First we call the things points, then we call the bunch a space; we preﬁx them by the word “sample” to distinguish these terms from other usages, and also to allude to their sta- tistical origin. Thus a sample point is the abstraction of an apple, a cancer patient, a student, a molecule, a possible chance outcome, or an ordinary geometrical point. The sample space consists of a number of sample points and is just a name for the totality or aggregate of them all. Any one of the examples (a)–(f) above can be taken to be a sample space, but so also may any one of the smaller sets in (a')–(f'). What we choose to call a space [a universe] is a relative matter. Let us then ﬁx a sample space to be denoted by Ω, the capital Greek letter omega. It may contain any number of points, possibly inﬁnite but at least one. (As you have probably found out before, mathematics can be very pedantic!) Any of these points may be denoted by ω, the small Greek letter omega, to be distinguished from one another by various devices such as adding subscripts or dashes (as in the case of the two Barbaras if we do not know their family names), thus ω 1 , ω 2 , ω', . . . . Any partial collection of the points is a subset of Ω, and since we have ﬁxed Ω we will just call it a set. In extreme cases a set may be Ω itself or the empty set, which has no point in it.